Born on 28th April 1934 at Westerham, Kent, Vincent Powell-Smith showed his intellectual gifts at an early age. He studied at the University of Birmingham, where he received his LL.B. (1962) and LL.M (1968) and was admitted to Gray’s Inn in 1963. Whilst lecturing in law at Leicester Polytechnic (1968) and the University of Aston (1968-1975) he built up a strong private practice and legal consultancy. This included assuming a number of secretaryships of unusual bodies, including the Institute of Explosive Engineers, and of the National Federation of Master Steeplejacks and Lightning Conductor Engineers. Through his contacts with the building industry he found himself specialising in building law and contracts, publishing numerous books and articles and serving as joint editor of the prestigious Construction Law Reports. He was also much in demand as a speaker and was often the key speaker at major conferences. Raised in the Church of England he became a Roman Catholic in 1954, when he was fourteen. He converted to Orthodoxy in 1957 and soon expressed an interest in offering himself as an ordinand. He was advised to defer this course for a period and to place himself under close spiritual direction. The person he chose was in fact the late Bishop Marcus Valerius Bazille-Corbin (1887-1964), who had been called to the bar before his ordination and was himself a member of Lincoln’s Inn. He exerted a profound influence on the young Vincent and also shared a great love of history and ceremonial. 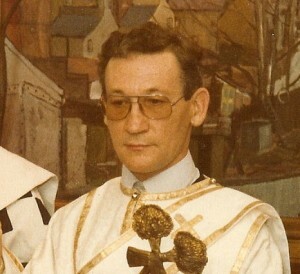 In 1975 the late Metropolitan Georgius admitted Vincent to the minor orders and he was ordained a full deacon on 23rd May 1976 taking the name Marcos in honour of his mentor. Although living in Leicester at the time, for some eighteen months he took an apartment at Blackheath to enable him to assist in church activities in London. Inevitably his secular work became increasingly heavy, but he remained in close touch with the church. Over the years he made a number of generous financial contributions to church causes and also paid the full cost of the ikonostasion at Cusworth in memory of his parents. In 1985 he moved to the Algarve, Portugal, continuing his writing and making regular visits to London, where he also served as an Arbitrator, although his specialisation had now moved into international fields. In 1991 he moved to Malaysia on accepting the position of Visiting Professor in Construction Law at Universiti Sains Malaysia. The following year he moved to Kuala Lumpur on becoming Professor in the Faculty of Law of the University of Malaya. He served on a number of government committees as well as being appointed General Editor of theAnnotated Statutes of Malaysia. Declining health caused him to retire from his teaching posts and, on medical advice, he moved to Davenport in Florida. It was during a visit to Malaysia that he was suddenly taken ill and died suddenly on 14th May 1997 at Kuala Lumpur, Malaysia, aged 58 years.